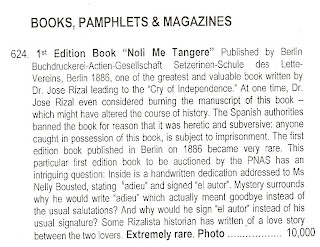 Image A: The PNAS International Auction Catalog, Image B: The Written Dedication of Rizal to Nelly Boustead, Image C: The Auction Description with Starting Price for the "Noli Me Tangere"
This is the Auction that everybody talks about. 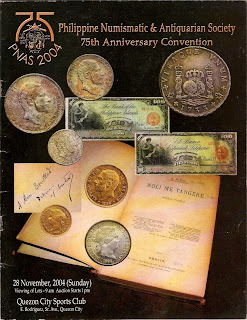 They were only aware of this rare auction based on accounts by other people but they have never seen the actual catalog. It is very rare to see one of the copies of the Noli Me Tangere even in pictures since only a number of copies was printed and did survive. 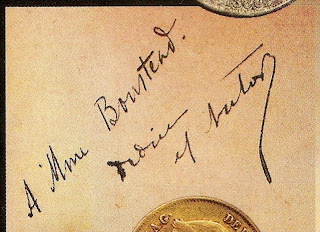 The photograph of the actual book was a very rare seen and seeing the actual dedication of Jose Rizal even in picture is phenomenal especially this one dedicated to Nelly Boustead, and with “the dedication” shrouded by mystery. Did Rizal know that he was going to die then at the hands of the Spaniards? Well, most of us could only recall Rizal’s love affair with Josephine Bracken and that Rizal was a reformist and not a revolutionary. But what had happened then why the reformist who declined a number of offers to join the Katipunan, who was not in favor of absolute Nationalism, and who have lived most of his life in a foreign country rather than his became the igniting flame of the revolution. Perhaps this book gave us the clue. Whatever Rizal’s reason that he made this dedication, it surely made me think again about my Rizal subjects back at the university.